Young and talented, stunning and O So Gorgeous, Rihanna oozes feminine charm both on and off screen. She is one of those rare believers of the fact that ‘curvy is beautiful’ and has struck all the right cords in proving it. Being ‘thin’ has never featured in the agenda of this 26 year old stunner. Sporting a solid curvy frame with not an inch of flab has always worked better for her. However, a few months back she was seen to have gained some thickness around areas that could do without the bulk. A tiny peeping belly and arms that looked tad out of shape had caught the attention of the cameras. Rihanna, on the other hand, was completely relaxed and thoroughly unflustered with the comments being posted about her weight gain and instead, moved towards a solution to get back to her frame with right diet and exercise schedule. Hogging the limelight is another singing sensation, J LO who has shed off 10 pounds at 44, and looking awesome! 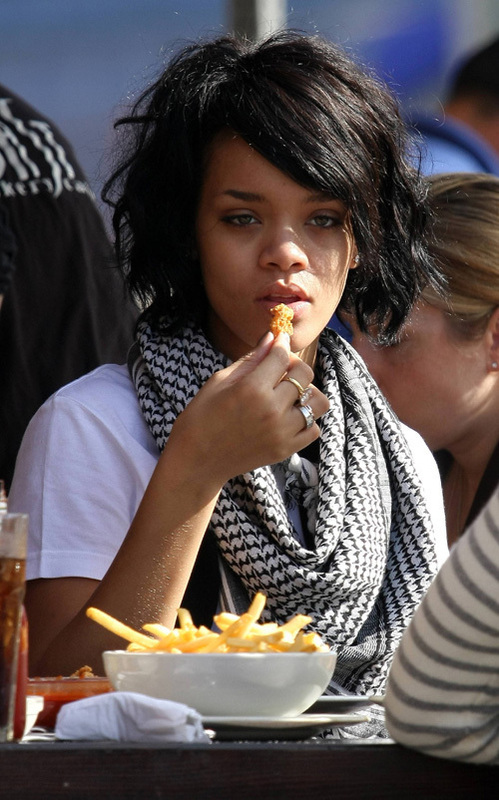 Rihanna’s diet plan is simple yet highly effective n warding off the unwanted calories. She has been suggested a 5 time meal by her trainer, Harley Pasternak. These meals are supposed to be small and contain all essential nutrients that the body requires including proteins, carbohydrate, fiber, vitamins, mineral and yes, ‘Good Fats’! This works magic in keeping her in a jaw dropping desirable shape. some of the primary foods that she maintains in her diet at all times includes egg whites, fish, mushrooms, potatoes, fruits like pineapples and grapes, assorted nuts, lemon with warm water etc. The young star has confessed that she has to include carbohydrates in her diet sufficiently because she gets weak if she ignores this nutrient for a couple of days. She has also confessed her love hate relationship with vegetables, which she has to eat to maintain her silhouette. You must be thinking that for a body this beautiful, Rihanna must be putting in all of her 24 hours working out to perfection. This is SO not the case. On normal days, she puts in only 25 minutes of workout and that too for 3 days in a week. When she is touring, she increases the schedule to cover 5 days and no more. on the days she is working out, her schedule is a mixed bag cardio workout including pushups and spot jogging followed by lunges, spot jumping and exercises for her abs. Left to her, she loves to do the treadmill and is happiest when jogging on the machine. Her buttock is the favorite part of her body upon which she emphasizes the most. Unlike many celebs, Rihanna is not a fitness freak nor is her dedication to shape dependent upon or influenced by what others have to say. At this very moment, she is rocking the world with her perfectly chiseled yet curvy frame, sporting designs that make her even more delectable that she has ever been!